The biologically active form of folic acid essential for good health, especially in pregnant and nursing women. Purchase this product now and earn 4,650 Reward Points! Folic Acid is a B-Vitamin, which is essential to good health. 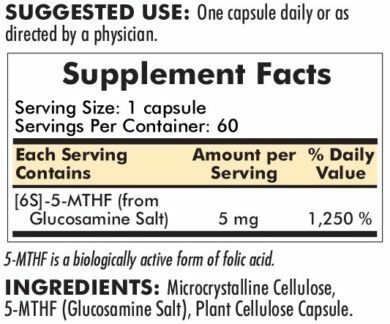 Folic acid is commonly recommended by physicians as a prenatal supplement. 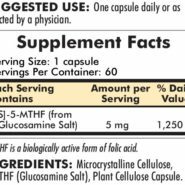 Studies have shown that 10%–25% of individuals may not fully absorb the form of folic acid commonly found in foods and dietary supplements. In those individuals, an active form of folic acid is required so that certain biochemical conversions are bypassed. 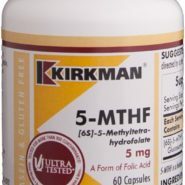 Kirkman’s 5-MTHF is a biologically active form of folic acid. 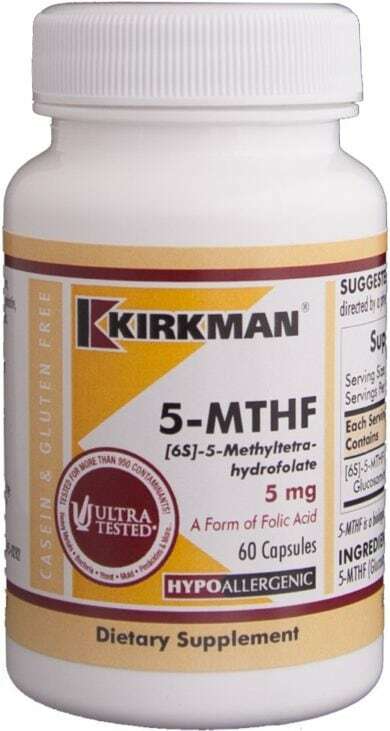 If you are unaware of your folate status or if your physician has advised you that you have a genetic mutation that hinders folic acid absorption, 5-MTHF offers a safe and effective solution. FREE OF: Sugar, starch, soy, wheat, casein, gluten, milk, corn, egg, preservatives, yeast, gelatin, flavorings, colorings, peanuts, tree nuts or fish. INGREDIENTS: Microcrystalline Cellulose, 5-MTHF (Glucosamine Salt), Plant Cellulose Capsule.